Join our National Call with special guest Dr. Susan Horton*, Professor and CIGI Chair in Global Health Economics DOWNLOAD THE ACTION SHEET Half of the world has too much food-which increases food waste and rising prices-and the other half has almost nothing. Malnutrition is both the result of poverty and a cause of poverty. 2.6 million children continue to die each year from malnutrition, and an estimated of 2 billion people have protein, vitamin and mineral deficiencies. 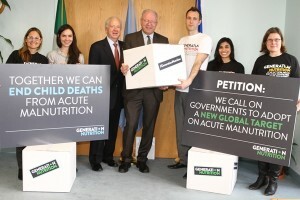 Let’s put malnutrition on the map! *Sue Horton is the CIGI chair in global health economics. She received her B.A. from Cambridge University, and her M.A. and Ph.D. from Harvard University, and specializes in health, nutrition and labour market issues in developing countries. She has worked in over 20 developing countries, and has consulted for the World Bank, the Asian Development Bank, several United Nations agencies, and the International Development Research Centre, among others.Sue has edited or co-edited four books, and is the author or co-author of more than 50 refereed journal articles and book chapters, as well as 30 technical publications. She is currently working on a book on the economics of public health, in addition to articles and chapters on the economics of nutrition. She has given over 80 invited presentations and conference papers in four continents. In addition to English, Sue speaks French, German and Spanish. She is also associate provost of graduate studies at the University of Waterloo. Previously, Sue has served as associate dean of the Faculty of Arts and Science, chair of the Department of Social Sciences and interim dean at the University of Toronto at Scarborough, as well as vice-president academic at Wilfrid Laurier University in Waterloo.